Why did you go Veg? As I became aware of the inherent cruelty associated with producing animal products I decided I did not want to contribute to the suffering of animals. What is your favorite thing to skate and why? I continue to surf, now over 38 years, and have gotten into rock climbing for the past 14 years. So I’m not skating as much, but my favorite place to skate was the Santa Paula Park Pool, and I like cruising around on my “Peggy Oki model skateboard.” Its not a longboard, its kind of shorter but a bit longer than I’m used to. What shoe are you skating in now? I like my Vans Rowley XLT’s and I’m disappointed to hear that he (Geoff Rowley) isn’t Vegan anymore. Or just say whatever you want about skating Veg… Keep skating as long as you don’t hurt anyone else, cause no harm, and apply that cause no harm ethic to all other living things on the planet. Cause no harm to the animals, they are sentient beings. I strongly encourage people to watch Earthlings and the Cove. It’s important to understand our connection to animals in so many ways that are not even imaginable to people. The decisions that we make and what we consume affects animals. I think everyone needs to be aware. Once you’ve seen Earthlings you decide what you’re going to do from there. 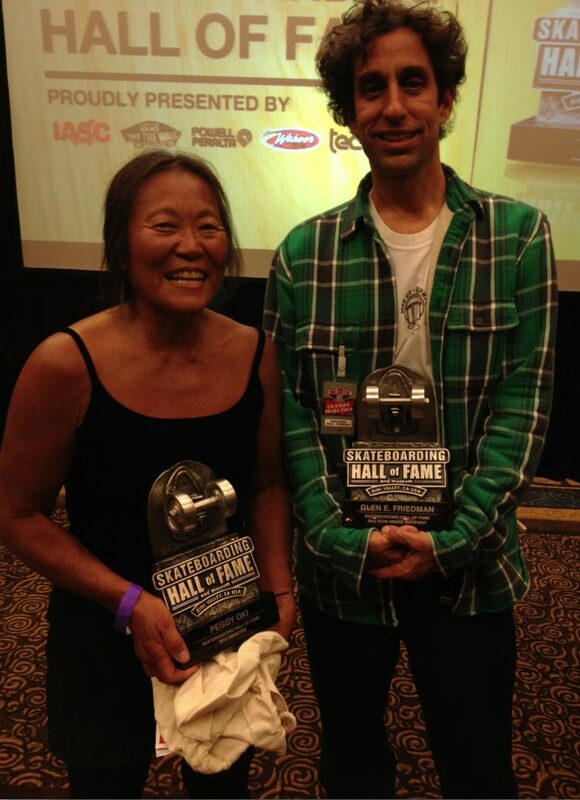 I was very excited to meet Dogtown’s only Z-Girl, Peggy Oki, in May when she was inducted into the Skateboard Hall of Fame. She is a kind and passionate person with an infectious smile and is doing some tremendous work educating people about the plight of Whales and Dolphins. Peggy is beyond inspirational and reminds me that even when you have a seemingly impossible job ahead of you, its important to keep pushing. Here is the extended interview (though not much of an interview since I was kind of geeking out and just listened to Peggy talk the whole time.) For more info about Peggy, check out her pages. Origami Whales Project and “Lets Face It” Visual Petition. You were an early skateboarder and very influential, and now you’re involved with activism through your Origami Whales Project. Can you tell me how you came from one to the other? Most of us have not been aware of all of this that has been going on, including whaling which I thought had ended. However, I found out that since 1986, whales are still being hunted and killed and I was like, “What, I thought that Whales were saved?” But in reality they weren’t. So since 1986 the number of whales being killed as reported by the whalers was close to 38,000. But realistically because the whalers don’t report whats called “struck and loss”, which those are the whales that are stuck by a harpoon when they are rocking on the bow of a ship when they’re rocking on high seas. They just make a glancing blow or might just strike a part of the whale, but the harpoon doesn’t sink in and explode to kill the whale, so the whale gets away and dies at some point. So the whalers don’t report that either. So it’s very likely that it’s a number close to double that. So probably 80,000 whales have been killed since 1986. The three main whaling nations – Norway, Japan, and Iceland – have continued to do this. I wanted to do something to raise awareness about this. I came up with the idea in 2004 when I was asked if I would like to be an Art Activity Coordinator for the Whale Festival in Santa Barbara. It was proposed that there would be an origami sea creature activity. And I said, “We gotta do Origami Whales! This is the Whale Festival!” So then I thought of the story of the Thousand Origami Cranes. Have you heard of that? I think so, isn’t it like a children’s festival? No, it’s not really a festival, it’s a true story about a little girl in Hiroshima – her name was Sadako Sasaki. That happens to be my mothers name, Sadako. She was exposed to the bombing of Hiroshima. And the radiation led to her developing and dying of Leukemia. When she was in the hospital, some friends came to visit her, and they said, “Why don’t you fold a thousand cranes?” A thousand Cranes is a folk legend, that if someone has a wish that they really want, they fold a thousand cranes and then the gods might grant them that wish. So she wanted to go on living and she got to about 630 and then died. That story has been told around the world in children’s books to raise awareness about the threat of nuclear war. My family is from Hiroshima, my heritage is Japanese-American, and I thought, Wow, maybe we should do a thousand origami whales and wish to save them? And I looked up on the Internet and there’s a campaign going on called Whalewatch.org, which is a coalition of animal welfare organizations and I found out that there was about 1,400 whales on the quotas to be killed that year. So I thought, maybe I can go with 1,400 origami whales, that sounds like a lot to make. I contacted the campaign coordinator of WhaleWatch.org and she liked the idea. I kept in touch with her as I carried on from the Santa Barbara Whale Festival. I didn’t get quite that many so I started doing school visits and stuff and I finally got 1,400 whales and I told her about it and she said “That’s great, how about if you present them to the IWC (International Whaling Commission) delegate for the United States”. I said that’d be awesome. So she arranged for me to come out to Washington DC. I had to figure out how I would display these Origami Whales so that there would be a real impact for what this number means. So I thought, “What about if we made a curtain.” So I got together with a bunch of my friends, and all day and all night over a couple of days we hand-stitched this curtain and organized all the whales by color so there was this sort of rainbow going across. I went to DC and did the presentation. I was sponsored to go to IWC meetings in St. Kitts. I thought If I’m going to go then I’m going to bring my curtain and then I looked it up to see what the quotas where for that year between Japan and Norway, which were the only countries at that time that was whaling. 2,285 were going to be killed, so the number increased by 885 and I was going “jeez”, so I added more, brought the curtain to St. Kitts and did all I could to get media attention. There was so little coverage in international news about the meetings, and at that time it was also becoming more evident that the Japenese government was bribing developing nations with both fishery incentives going to nations that have very little economic strength. They would basically bribe them to vote in favor of whatever the japanese government would propose for their whaling effort. So I was feeling like, “Oh my gosh there is no coverage so what else more could I do?” And I saw a video that talked about the issue of whaling and pointed out that since 1986 nearly 25,000 whales had been killed. And I hadn’t known that tally until seeing that video and I said, “Oh my god what am I going to do, maybe if I make a curtain of 25,000. I was offered a fiscal sponsorship, a non-profit umbrella is another name for it, which allows for tax-deductible donations. I’m a one person organization pretty much. Did you make all the whales yourself ? No, no. It was cool, because making the whales involved educating people , including children and letting them know what’s going on and encouraging them to fold whales. So literally by the time I got this big curtain going, there were thousands of people that folded origami whales and sending them to me. It took a lot of effort. And I had got this non-profit umbrella through Cetacean Society International. This meant people could make tax-deductible donations to support my effort. I was in touch with some of the animal welfare organizations, and I was told that the number was actually nearing 30,000. And I was like, “Oh my God how am I going to get 30,000 whales?” But I decided, if I get that many then it’s going to happen, I’m going to make that curtain with as much as I can. I actually did make that goal of 30,000 origami whales. All hand-stitched by local volunteers into this curtain. I took it to Anchorage, Alaska in 2007 and displayed it during the IWC meetings at the Alaska Center for Performing Arts. It was a really beautiful space for the first exhibit. Very well received. I also exhibited it at the Alaska Ocean Festival. In the four years following I exhibited it and each year adding a couple thousand origami whales, so now it’s up to almost 38,000. The four years following the IWC meeting I was invited to exhibit the curtain at Whale Day on Maui. And what work are you doing now? When we talked before the interview you said you are doing something in New Zealand? That’s really powerful, other than the Let’s Face It Campaign, do you have anything else that you tell people when they are concerned or want to get involved about the dolphin situation of fishing practices, what they can do? Well you know, there are a lot of issues going on of all sorts around the world and people ask me about activism and I say “Look into your heart and find whatever you feel passionate about.” What ever really deeply concerns you. It might not be about helping dolphins or whales. It may be working in a youth program, helping the elderly, getting kids off the street, and uh “skating the streets.” There are so many different things. Of course saving the environment and thinking consciously of our impact as humans on just our use of resources. I teach a class actually called the Whales and Dolphins Ambassadors Program. Where do you teach that at? Wherever I can actually… I’ve been teaching it in the Santa Barbara area but I’m open to teach the Whales and Dolphins Ambassadors Program wherever I am invited. I educate kids on the natural history of dolphins and whales. I get them excited. I call it Cetacean-Appreciation. Its 5 days in a row. In the morning I give them a lecture about the dolphins and the whales and the issues that are effecting them and then the other half of the class in the afternoon is some sort of art project which is a solution to the various problems. They have sentience, and it can be so complicated trying to figure out – this fish has been more sustainably caught, or this fish is factory raised just like we factory raise animals, and you know what happens to the other animals raised in farms. I’m Vegan for Ethical reasons. People ask me about that and I go, Ethical reasons is the first reason, and because it’s also much more healthier for the environment, and being healthier is a benefit for it! This entry was posted in Activism, Vegetable Shredder. Bookmark the permalink. What a fantastic lady! Stoked! !